Barely touching the Delta’s north-eastern edge, the Khwai Community Concession runs along the Khwai River, just beyond Moremi Game Reserve’s North Gate. This small concession (number NG19) is owned and run by the community in nearby Khwai Village. About half a dozen midrange to luxury lodges operate here, as well as a couple of very basic campsites, all along the north bank of the narrow Khwai River. The river itself very rarely runs dry and is a magnet for game passing between Moremi and Chobe National Park to the north. It’s a beautiful, low key area that has the advantage of being easily accessible by 4x4 from Maun and also makes an excellent stopover between Moremi and Chobe. 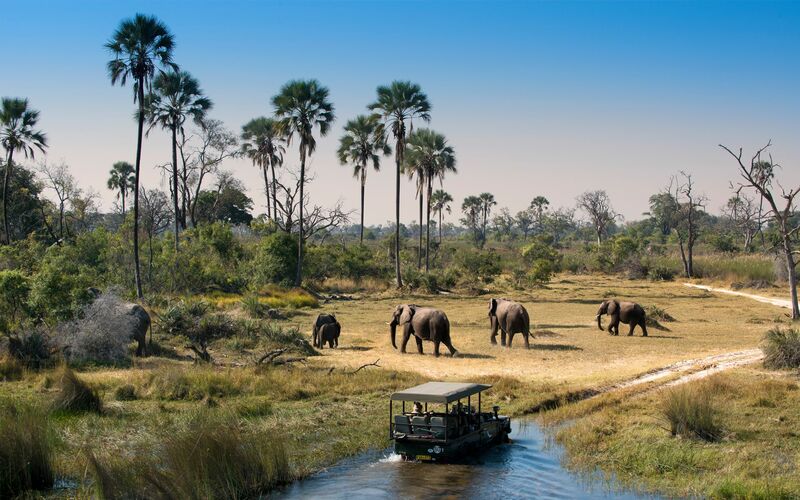 Excellent wildlife, especially close elephant encounters: The Okavango Delta is well-known for its phenomenal wildlife, largely because of its abundant water. The Khwai River is the nearest source for thousands of animals that forage and hunt in the mopani forests between Moremi and Chobe. As such, the river attracts plentiful wildlife, especially in the dry winter months when hot, thirsty elephants gather along its banks. Cultural village tours: Tours of Khwai Village can also be arranged with the community directly or through one of the lodges that operate along the river. They’re a great way to see first-hand how the concessions benefit the community and speak to villagers about their traditional way of life. The Khwai region can be reached in a few hours’ drive from Maun, but you’ll need a 4x4 to negotiate some thick sand and a few water crossings. Alternatively, there’s a small airstrip which serves the lodges along the river. The village itself has a small shop, but supplies are very limited – perhaps no more than a few cool drinks and some crisps. If you’re not staying in a lodge, you’ll need to take everything with you; note that the two community campsites don’t have ablutions.